In September we had guests taking a break from their work in Brunei. Kiko and RJ are good friends and their hobby is sports fishing, and they planned to bring some of their Bruneian friends to the Philippines for a fishing holiday. In the end, their friends dropped out of the trip and it was just Kiko and RJ. 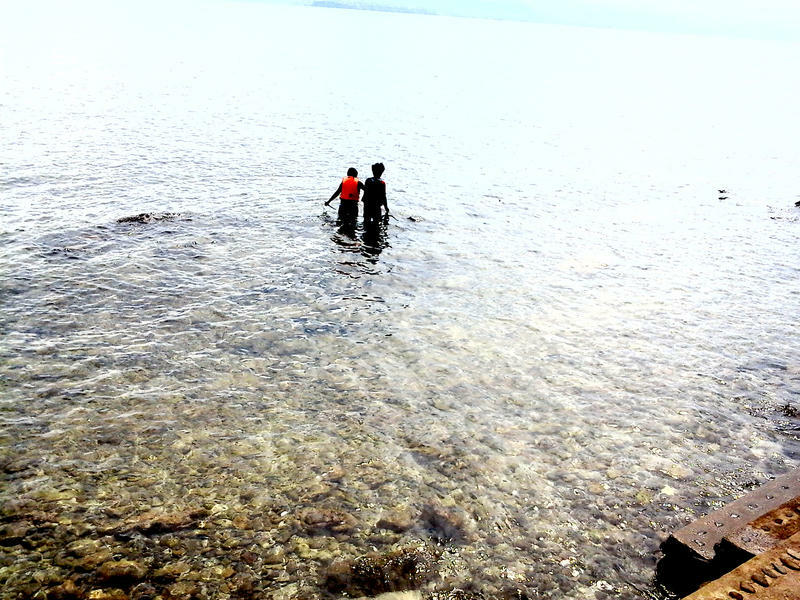 So they started to look for a place where they can catch fish. 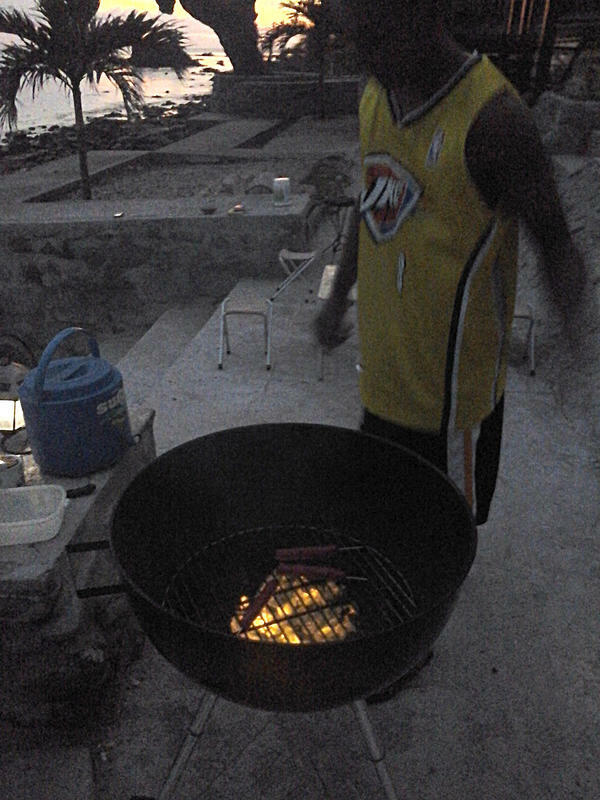 As Kiko is from rosario, Batangas they tried San Juan, Batangas, but unluckily they didn;t catch any fish there. Then they decided to try around Isla Verde, and on Wednesday September 9th they arrived on the St Paul. 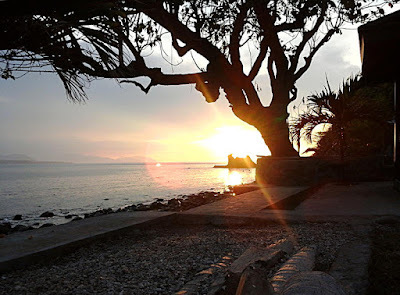 St Paul unloaded her cargo and passengers at Pondohan, which is about a ten minute pleasant walk from our resort. Tupe went to meet them and guide them and they arrived before noon, in time for a simple meal of rice , with grilled pork, veggies cooked in cocunut milk, kalamay na mais for their dessert and cold iced tea. 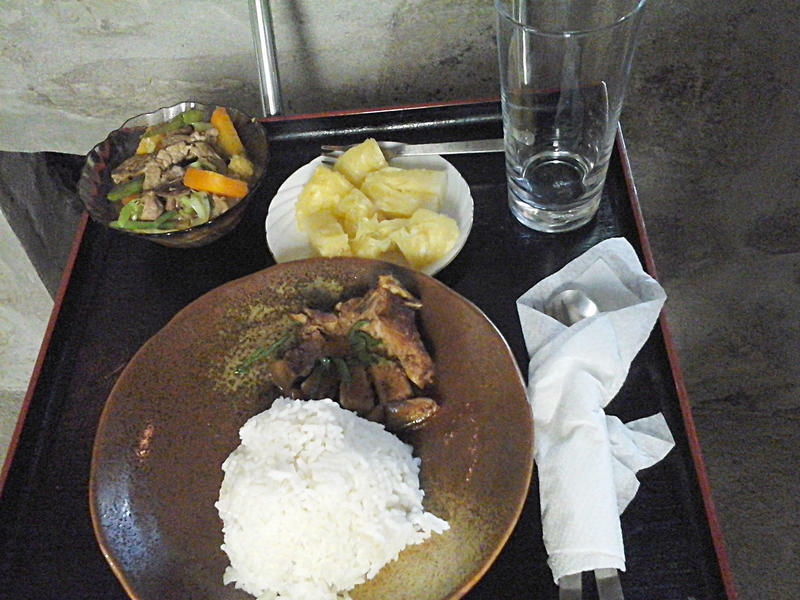 They enjoyed eating lunch with the cool sea breeze creating a relaxing atmosphere as a welcome to our island. After lunch the boys began to prepare their rods and fishing gear. They brought galunggong (fish) for their bait while, our boys Tupe and Leo had UMANG as bait. UMANG are cocunut crabs and seashell. They cracked the shells and took the meat from them for bait. It was a surprise for our guests, and our boys from the resort challenged them for fishing. The prize was for 2 bottles of our local gin GINEBRA SAN MIGUEL. They brought snorkel gear too and I suggested they should see the reef just off the resort since we are just on the edge of the sanctuary. 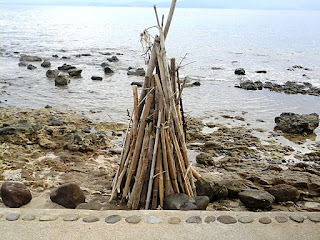 Tupe and Leo prepared the boat and all of them went off to the sea. 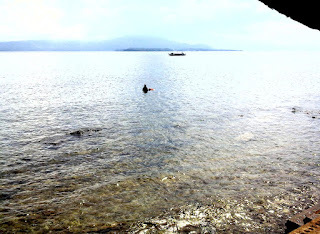 As it iss Habagat, the sea was a bit rough, and they kept sailing to look for a catch. They stayed on the water till 4pm and when they came back, they had caught small fish and a big clam, but they lost the challenge to our boys. Leo took the meat from the big clam and soaked it in vinegar with onions, garlic, chili pepper and salt. We call it KINILAW. Tupe cleaned the fish took out filleted them and fried them. They were served after dinner with the drinks. Later we had dinner at our bamboo table which faces the sea. As the night fell we remained there and had drinks with the food they caught from the sea. Kiko and RJ were supposed to only stay overnight in our resort, but as we were chatting I told them they might enjoy going to Mt. Dagit Dagit for trekking and they decided to spend another day with us. At 10pm, as they were tired they decided it was bedtime. We woke up early to prepare breakast for them. I made Japanese omelet, fried hotdogs and ham and miso soup, then I packed food for their trekking. At about 9am they headed off to trek up Mt. 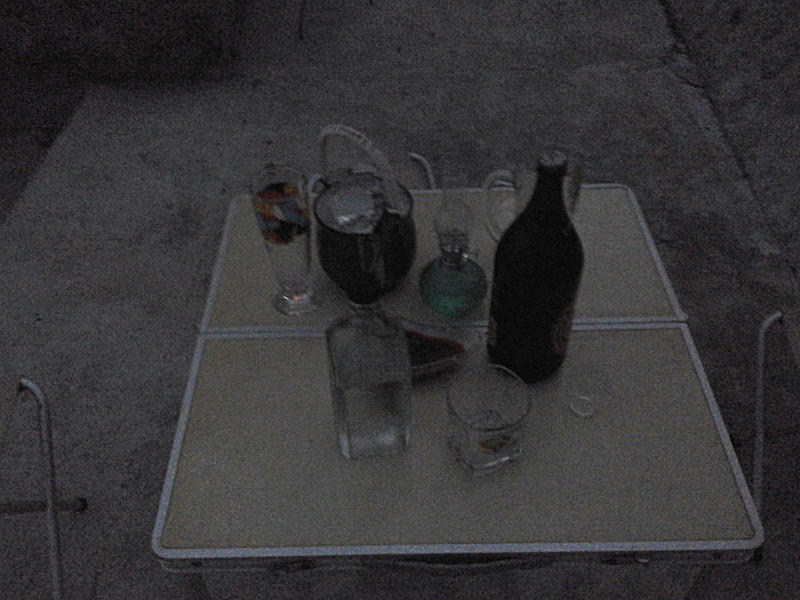 Dagit Dagit. About 1pm I was surprised to see they had arrived back from the mountain. They came back early because they wanted to have a rematch in fishing with our boys. This time at Mahabang Buhangin. So they prepared their fishing rods and gear and off they went to Mahabang Buhangin. 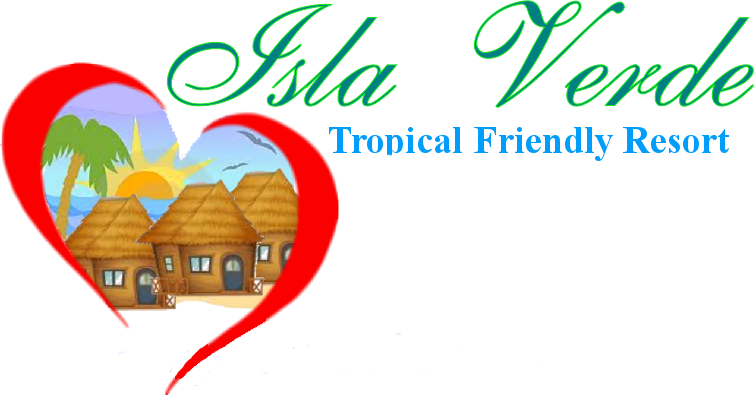 Its on the easr coast of Isla Verde, with clear water over beautiful white sand. They got back to the resort before sunset, after once more losing to our boys. Dinner was served at 6pm, and Junaly, who helps at the resort, came and joined us for dinner. After enjoying dinner we had drinks and relaxed. Junalyn joined us, too and she was the story teller that night. Our night was filled with laughter and fun and Junaly bid us good night at 9pm. After they finished 3 bottles of gin, all went to bed as RJ had to leave in time for his return flight to Brunei. His friends from Brunei will visit us this coming December. On 3rd September we had an overnight guest at the resort. Daze came from Manila to take a break from the city. She came over on the St Paul and arrived in the morning, and decided to relax after her trip. While she was resting I made lunch, then Tupe served her meal in our kubo. After her lunch Daze wanted to take a dip in the sea and try snorkeling. Tupe guided her underwater across the reef just out from our seawall. 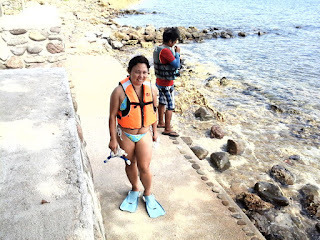 The reef comes close to the resort and our seawall was designed to allow guests easy access for swimming and snorkeling with wide steps down and a nice wide pathway where some guests like to sit at hight tide with their legs in the water between swims. Daze was happy to see brightly coloured fish swimming around here and to admire the different corals. After a few hours of swimming she decided to explore the resort surroundings and took pictures of her favourite views. While she took pictures we had a coffee break and a chat with each other. In the meantime Tupe and Leo prepared the Japanese tub and when the water was warm, daze took a dip in the tub and enjoyed the scent of the citrus leaves in the water and the calm relaxing feeling you get from the hot tub. 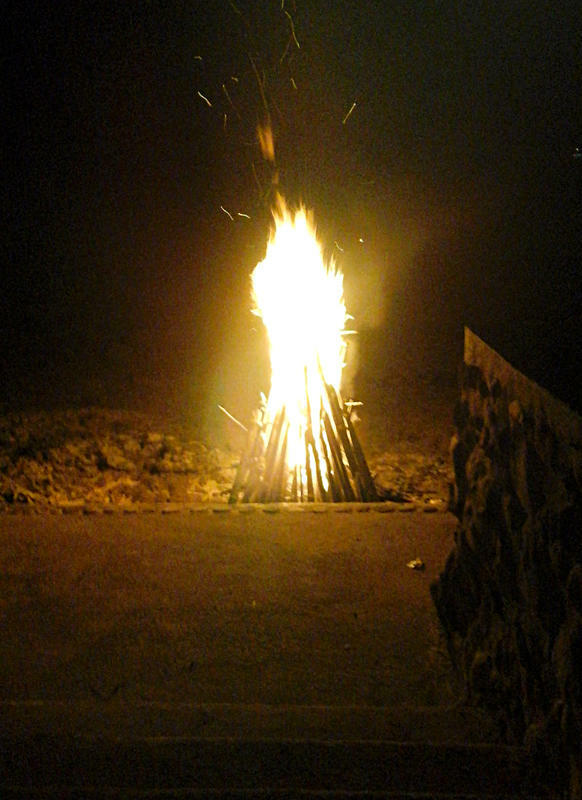 As she enjoyed the tub,we prepared our bonfire and barbecue party for the night. 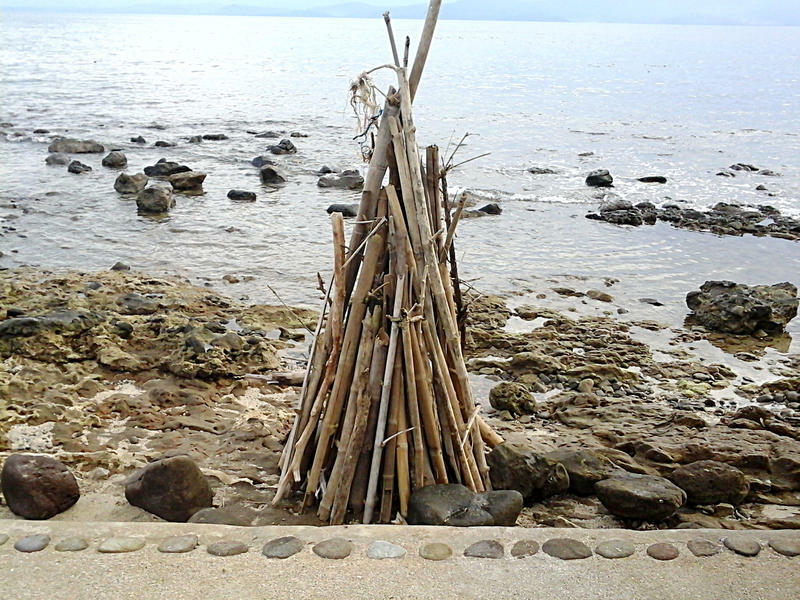 The boys gathered bamboos and other timber and formed it into a pyramid for a bonfire. After her bath in the Japanese hot tub Daze changed her clothes then and took some photos of the sunset before joining us for the evening bonfire and barbecue. 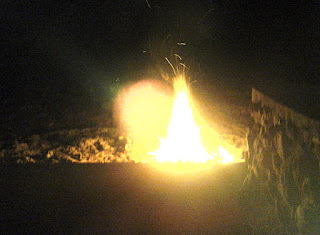 After an evening around the fire enjoying barbecue hotdog and cold beer, daze decided that 9pm would be bed time because she had to leave early to be aboard the St Paul for her return to Tabangao in time to head back to the city. Daze promised we will see her again. Maybe next time she can stay longer and enjoy more of our lovely island.